Prueba del movimiento internacional de adopción de estándares libres y su eficiencia ,puede ser el hecho de que cada vez surgen más proyectos vinculados al software libre auspiciados y empleados por organismos públicos internacionales. En este caso traigo al blog un proyecto que me parece sumamente interesante, es el proyecto Xena del los Archivos Nacionales de Australia, del gobierno Australiano. Simplemente os bajáis de la página del proyecto el software y hacéis doble click sobre el fichero xena.jar para tener acceso a la aplicación de la imagen. Para facilitaros las cosas os copio a continuación los formatos con los que trabaja y el tipo de fichero al que lo convertirá; eso sí, en inglés. During the process of normalisation, Xena will convert the following file types to the specified open format. Should Xena be asked to normalise a file format not yet supported, the process will fall back to binary normalisation. GZIP The archive is un-compressed and the resulting file is processed as normal. JAR All files are extracted from the archive and normalised into a separate Xena file. 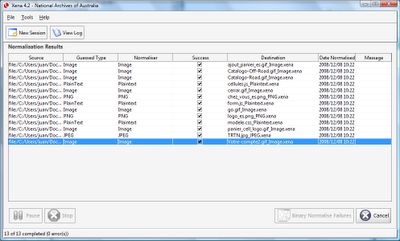 A Xena index file is created, which when opened in a Xena viewer, will display the files in a table. MAC BINARY The archive is un-compressed and the resulting file is processed as normal. TAR All files are extracted from the archive and normalised into a separate Xena file. A Xena index file is created, which when opened in a Xena viewer, will display the files in a table. TAR.GZ Works as a combination of 'GZIP' and 'TAR'. The archive is un-compressed and the resulting tar file extracted to reveal individual files for processing. WAR All files are extracted from the archive and normalised into a separate Xena file. A Xena index file is created, which when opened in a Xena viewer, will display the files in a table. ZIP All files are extracted from the archive and normalised into a separate Xena file. A Xena index file is created, which when opened in a Xena viewer, will display the files in a table. AIFF Converted to open format, FLAC. FLAC Already in an open format, so processed as binary. MP3 Converted to open format, FLAC. WAV Converted to open format, FLAC. SQL Structured Query Language files are processed as plaintext wrapped in XML. CSV/TSV Comma and Tab Seperated Values based files are stored as a special case of plaintext. DOC/PPS/PPT/XLS Microsoft Office documents are converted to the Open Document Format. ODS/ODP/ODT Files in the Open Document Format are preserved as they are. RTF Rich Text Format is converted to Open Document Format. SYLK This spreadsheet format is converted to Open Document Format. SXC/SXI/SXW StarOffice formats are open, but are converted to the newer Open Document Format. TXT Stored in plaintext wrapped in XML. WPD This Word Perfect format is converted to Open Document Format. WRI Microsoft Write files are converted to Open Document Format. XHTML Stored in native open XHTML format. XML Stored in native open XML format. MBOX Mailboxes are converted to individual XML files and a Xena index file is created which will display the files in a table when opened with Xena viewer. PST Mailboxes from Microsoft Outlook are converted to individual XML files and a Xena index file is created which will display the files in a table when opened with Xena viewer. TRIM Messages from TRIM are converted to XML and a Xena index file is created which will display the files in a table when opened with Xena viewer. BMP Bitmap images are converted to the open format, PNG. CUR Windows cursor files are converted to PNG. JPEG Stored in native format. PNG Stored in its native open format. PSD Photoshop files are converted to PNG. SVG Scalable Vector Graphics files are XML, so preserved as is and wrapped in Xena XML. TIFF Converted to PNG with embedded metadata stored in Xena XML. CSS Stored as plaintext wrapped in XML. Scripts All scripting files are stored as plaintext. Gracias por la aplicación. Es muy interesante.